So, I actually made this cake a couple weeks ago, but we didn't have this blog then, and I still want to tell you about it because every time I think of it I get a little bubble of pride! 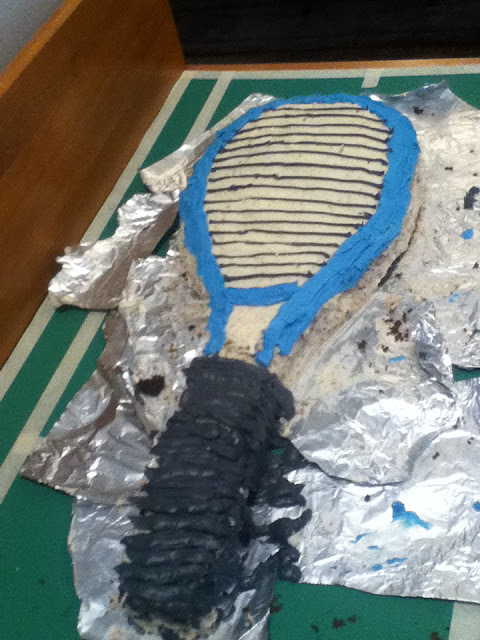 It is a delicious chocolate cake (the same one featured in my last post) shaped and frosted like a TENNIS RACQUET surrounded by little vanilla cupcakes frosted like TENNIS BALLS. The occasion? 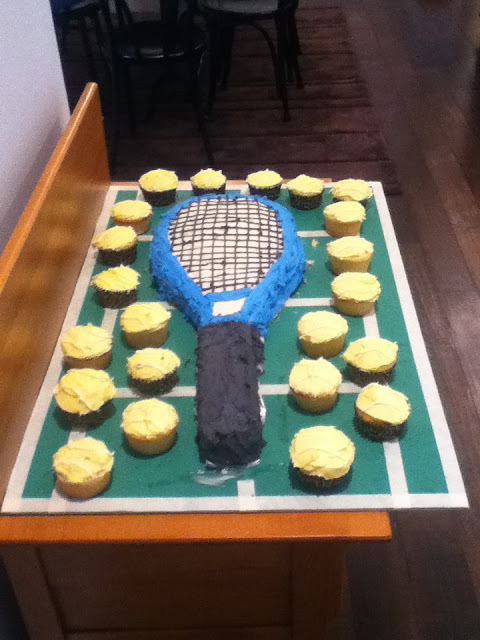 My brother's tennis team's end-of-season party! Yup, a bunch of teenage guys (I'm sure some girls my age would be super happy at this news- but I was not. They are old. And my brother's friends. And loud. And annoying.) came over to our house with their parents, and we had up to thirty or so people in our house (that's a record), only three of which I really spoke to (my mom, my dad, and my brother) and maybe seven of which I knew the names of. Fun. Not. I read a book the entire time and was interrogated by interesting characters- and thankfully saved by my dad before the conversation got to the point where I probably would have, very un-tactfully, practically ran away. But what was fun was receiving all the compliments about my cake! The day before the party, I baked the cake: one circular and one square pan of chocolate, and 22 vanilla cupcakes. I also taped out a tennis court onto a green poster board. On the day of the party, I spent basically the whole day making frosting, assembling the cake into the right shape, frosting it, then decorating it, then showering to get the sugar-coated feeling off. 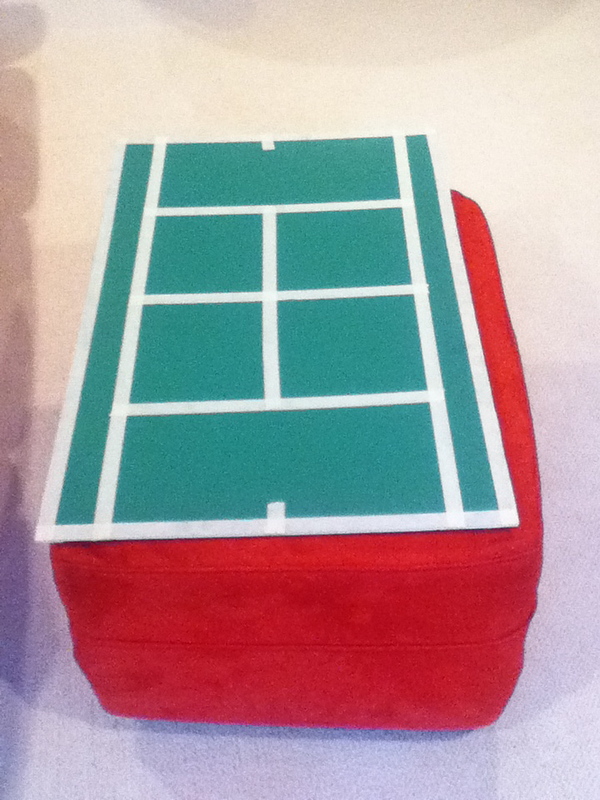 To make the tennis racquet shape, I cut the circle in half, then cut a section out of the square to elongate it into an oval. Then I added a throat-shaped piece and used the rest of the square to make a handle. It's a little confusing, so hopefully this picture will explain it better! Maybe because of my thick first layer on the cake, I was out of frosting! So I quick whipped up another batch and used that to decorate all the cupcakes like tennis balls, and placed those around the cake. At this point, I was feeling coated with sugar from handling frosting and cake all day (And sometimes nibbling at it if say, some got stuck on my hand. But hey, I'm still growing, I could use the extra calories. Maybe.) So I still had time fore a shower before the guests started arriving and I was showered with compliments. 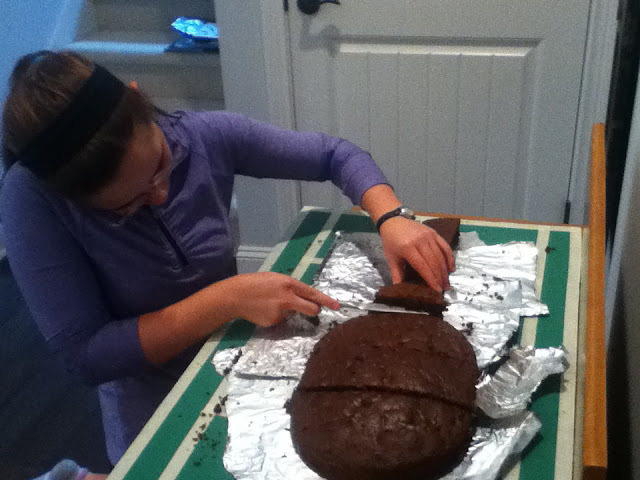 I mean, you have to be presentable when people learn that you made the wonderful cake they were about to devour! It was a hit, but we had leftovers for the entire week. We probably would have had more for longer, had my brother not come home the next day from school, and without thinking eaten half of the remaining cake. In one sitting. As an after-school snack. But this is the guy who once drank two liters of root beer in a day, so it wasn't a huge deal (although I thought it was! ).